Pro-Erdoğan journalist to UK ambassador to Turkey: You sons of *itches! 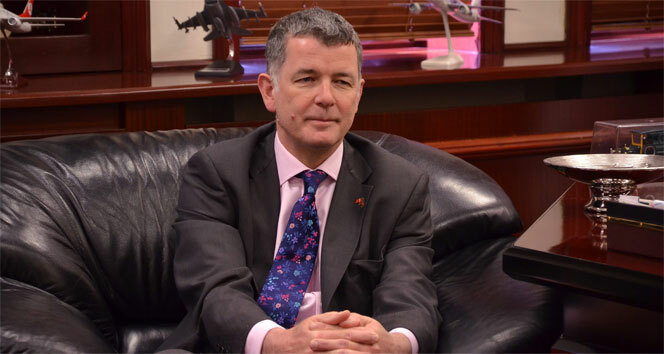 Pro-Erdoğan TV presenter Ertem Şener on Wednesday attacked Richard Moore, British ambassador to Turkey, on social media, using offensive language that included expletives. “Boss of the murderer who killed children with chemical weapons in Syria cannot talk about spring and tulips! 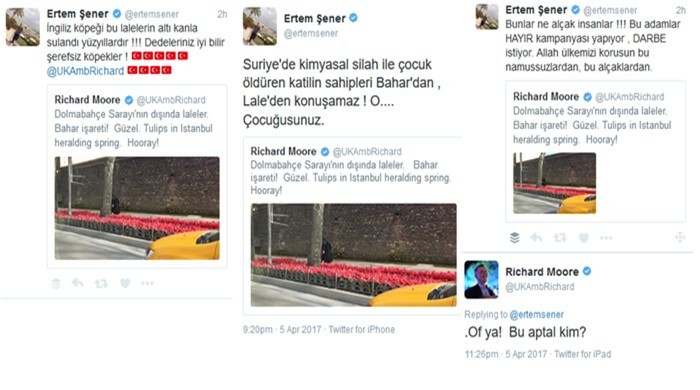 You are sons of *itches,” said Şener in his Twitter message, quoting a tweet of Ambassador Moore on spring. “Tulips in İstanbul heralding spring. Hooray!” said Ambassador Moore in a tweet with a photo of tulips outside Dolmabahçe Palace in İstanbul. “They explicitly give this sort message to Turkey. They say that if the coup attempt had succeeded, those tulips would have blossomed earlier. Come on boys, come again!” said Şener in a follow-up Twitter message. “British dog! The soil of those tulips was irrigated with blood for centuries. Your grandfathers know it well. Dishonored dogs!” added Şener. “They are such vile people!!! Those people campaign for [a’ ‘no’ [vote], want a military coup. May Allah save our country from those dishonorable, those vile people,” said Şener in another Twitter message quoting the ambassador’s the same tweet. “Come on! Who is this stupid,” said the ambassador in response to Şener’s tweet. On March 23, Moore became the center of attention when he criticized an advisor of President Recep Tayyip Erdoğan for not condemning a London terror attack that killed five people and wounded many more. “Terror attack in England. Terror says Europe: The UK is your safest region? I would hit you in your safest place,” said Burhan Kuzu, a chief advisor to Erdoğan, commenting on the London terror attack last month. Moore similarly slammed the pro-government Star daily’s Editor-in-Chief Nuh Albayrak, who called the London attack a comedy, implying that the terror attack was plotted. Albayrak tweeted after the London attack and condemned Turkish TV stations for “contributing to the perception operation” being conducted by the British. This article originally appeared in Turkish Minute on Apr 5.